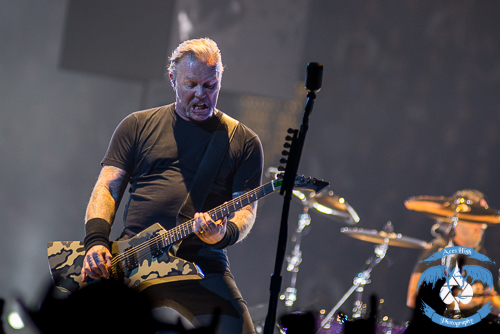 KNAC.COM - Reviews - METALLICA In Cleveland, OH With Photos! 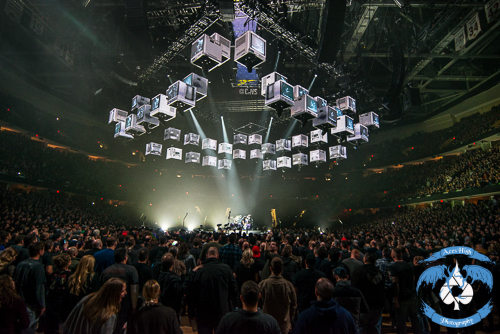 METALLICA In Cleveland, OH With Photos! 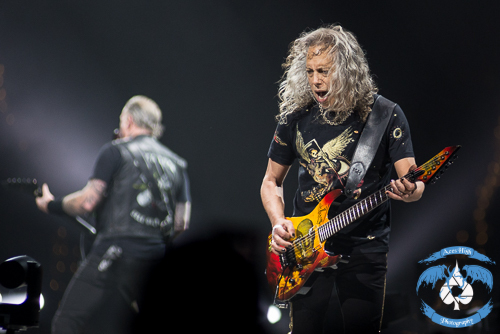 It had been ten long years – or 18 quarterbacks (based on Cleveland’s time-keeping system) – since the mighty METALLICA graced a stage in the 216 area code. Based upon the capacity crowd of 20,000 + and the seemingly endless lines that surrounded the arena in the bitter cold, I’d say they were a bit overdue. Lending a hand at hyping up the droves of METALLICA fans was comedian Jim Breuer, slated as the odd opening act. The former SNL favorite and Half Baked star has made a career out of goat noises and METALLICA impersonations. Like a quintessential cheerleader, Jim stirred up enough energy with his antics to muster whoops and whistles. “METALLICA can hear you”, he begged. 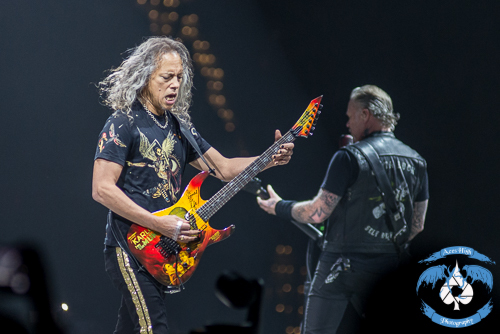 The career-spanning set was enough to quench the thirst of classic METALLICA fans, like myself, without forgetting that the godfathers of thrash were amidst a new album cycle. 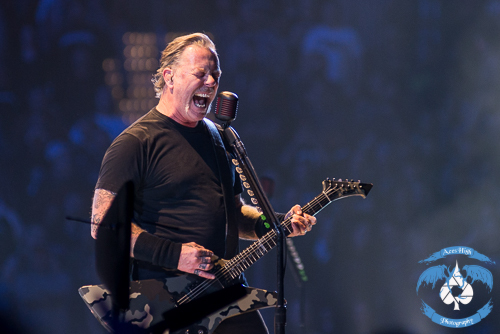 Taking a page out of IRON MAIDEN’s book, METALLICA force-fed several of the new tracks off of Hardwired…To Self Destruct, all of which were welcomed with a warm reception. 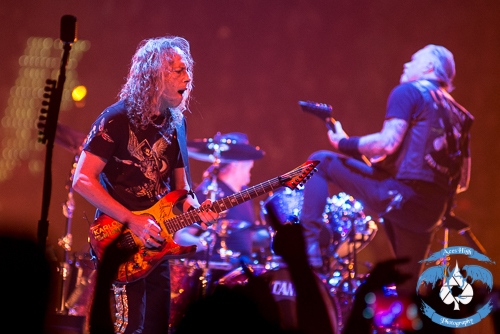 This one-two punch of classic and fresh METALLICA continued to bludgeon the arena throughout the duration. The group reached as far back in their careers as possible for “Hit The Lights”, while flawlessly ripping through “Fuel”. As expected, production was top notch. Lighting, pyro, fire works and drones…wait…drones? Yeah, drones were used during “Moth Into Flame” to mimic the appearance of moths flying around Lars’s drum kit which was lit up in a orange, flame-like glow. I was a skeptic at first, but damn it was cool. They were all completely synchronized and moved in and out of the trap doors in the floor of the stage with precision. It is also worth mentioning that there was a drum break with all four band members – like a BLUE MAN GROUP type of drum break. It was cool, but I think I would have preferred “Dyers Eve”. 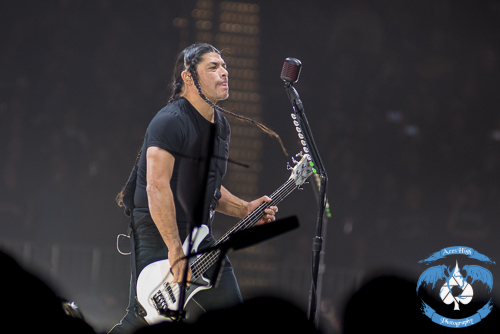 In addition, bassist Robert Trujillo managed to perfect Cliff Burton’s “Phantom Lord” bass solo – an awe-inspiring moment that left most of the venue speechless. 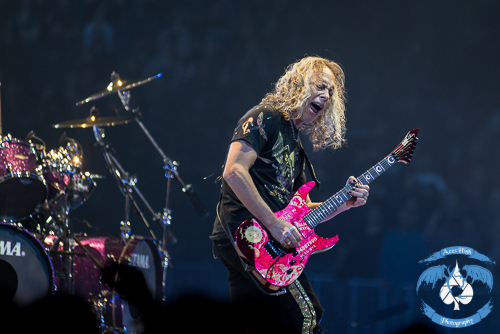 Robert and guitarist Kirk Hammett also held a little “jam session” while James and Lars regrouped. At times it was hard to realize what was exactly happening, but the two of them played an ode to hometown greats with “Funk #49” by JAMES GANG and “My Town” by MICHAEL STANLEY BAND. I think they were both meant to be sing-a-longs, but it just sort of petered out. Give them credit for trying though and I was a bit disappointed that it never did materialize into a sing-a-long. 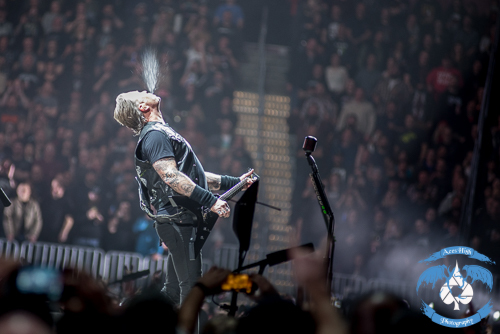 From time to time, James Hetfield would address the crowd in a fatherly tone, speaking about the “Metallica Family” and the array of generations in attendance. 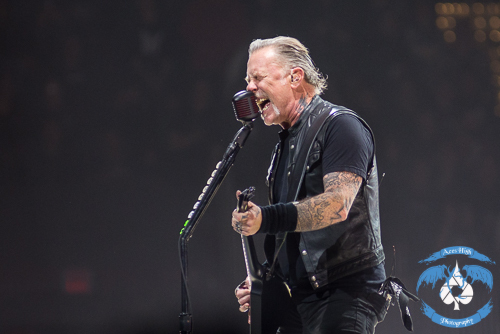 He quipped that he had “earned this gray”, referencing the shiny mop of silver that was slicked back atop his head which now sports the classic Hetfield handlebar mustache. 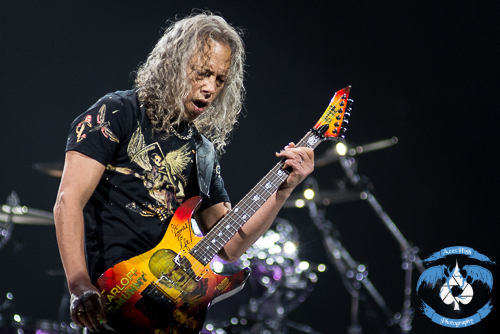 The “Papa-Het” patch on his vest represented his demeanor well – just the right amount of aggressiveness without going overboard. 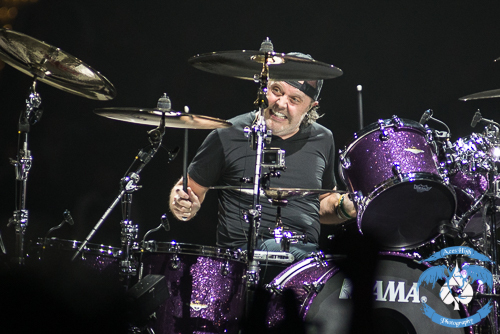 Lars on the other hand was constantly leaving the throne to sprint around the stage, tossing sticks and engaging with fans whenever the song would allow it. I cannot help but wonder, if Lars would have just saved his energy, maybe he could keep a bit better tempo? 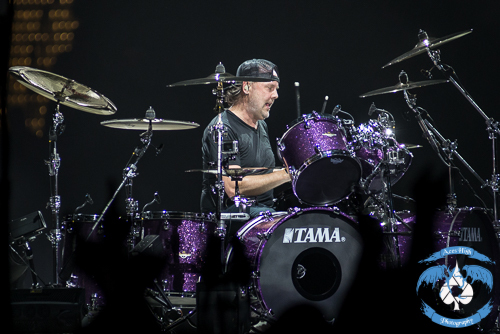 It is not that he was too slow or too fast – just kind of all over the place; my one and only gripe of the evening, but hey, drums are easily the most physically demanding part of the METALLICA quartet and Mr. Ulrich is not getting any younger. 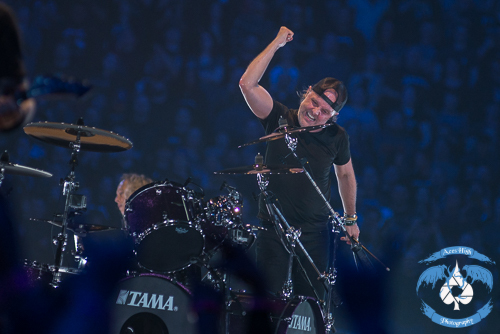 Throughout this leg of the tour, METALLICA has made an effort to switch up the setlist from night to night, so as you can imagine, I was pretty flippin’ excited when the intro to “Battery” rang out during the encore. I wasn’t the only one. Finally, the rather tame crowd decided to really cut loose and this was the song to do it. The night finally came to a climactic end with “Enter Sandman”. As a fan I have had many ups and downs with METALLICA throughout the band’s storied 38-year career, but this was my first live encounter and it was one to remember. 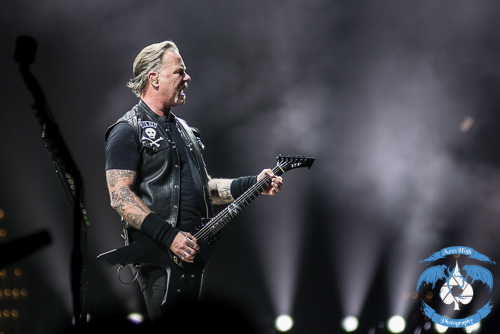 It is already a rarity to see METALLICA out on the road these days, so do not miss your chance to catch a stunner of a show.